William Nobrega is President and founder of The Conrad Group, LLC. (www.conradgroupinc.com), a consulting firm specializing in emerging market strategic planning, advisory services for institutional investor groups, and mergers and acquisitions. He has authored numerous articles and has been the subject of many profiles on television and in newspapers. Ashish Sinha is the COO of RocSearch, a UK-based research and analytics offshoring firm. He has more than twelve years of experience in investment banking, consulting, and knowledge process outsourcing. Over the last six years, Ashish has built business research capabilities at McKinsey & Company and GE Capital. Introduction. The History of India in [5?] Pages. I. The Largest Market the World has Ever Seen. II. Bulls & Bears in Mumbai: India's Financial Markets. III. Why India will Outperform China. IV. The Road Less Traveled; India's Infrastructure Opportunity. V. The Next Wave; Beyond IT & Outsourcing. VI. Look before You Leap. VII. Understanding the Indian Business Culture. Conclusion. The Tiger Begins to Roar. "If you're an investor, you need to know about India. Unfortunately, before Riding the Indian Tiger came out, snappy, all-in-one primers on India's past, present and future had been hard to come by. The list of companies that do business with India includes the likes of Sony (SNE - Cramer's Take - Stockpickr), Gap (GPS - Cramer's Take - Stockpickr), Microsoft (MSFT - Cramer's Take - Stockpickr), General Electric (GE - Cramer's Take - Stockpickr) and Wal-Mart(WMT - Cramer's Take - Stockpickr). But the list of investors with experience in India, who know its regions, tendencies and opportunities, is short. And much of what is written about the country falls into one of two unhelpful categories: political bombast declaring that India is ever-powerful and will sink America, and the business hype jobs that call India a source of evergreen profit for the average investor. What has seemed lacking, until now, is a balanced and digestible overview that tells a bit about India's history, a bit about its regions, a bit about how it compares with China and thoughts on its future. 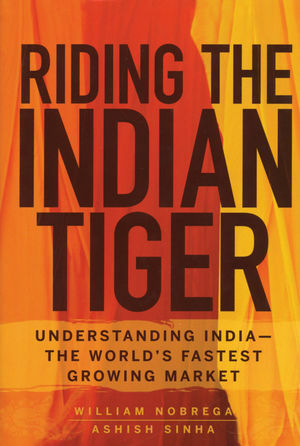 Riding the Indian Tiger: Understanding India -- The World's Fastest Growing Market, (Wiley) by William Nobrega and Ashish Sinha is a must-read and earns a coveted Business Press Maven "Help" label, granted with great ceremony to books that help advance investor understanding. It is not a thrilling read, but the prose isn't wooden, and it's less than 250 pages. That means no excuses. And here's the beautiful part: Place your finger down at random at almost any point in this book, and you'll learn something important, thought-provoking or, at the very least, interesting about a country that stands as a contradiction in a myriad of ways. Where to start? Well, anywhere. How about page 12, part of the opening section that gives an economic tour of India's different regions? Haryana, close to New Delhi, is an agrarian state with a dairy bent, a fast-growing economy and an essential long-term challenge: With an underdeveloped supply chain and little of the milk pasteurized, potential lost revenue abounds. Or, read any of the pages between 67 and 92, where the authors compare India and China, point to any number of examples of the free press in India leading to better oversight and less corruption or the overwhelming demographic advantages enjoyed by India. The authors also argue that fashion apparel will thrive in the near future in India because of the nation's cotton production, technological advances of its textile industry, and increasing disposable income. National fashion producers are not sufficiently up to the task; the authors smell big opportunity. For some similar reasons and others quite separate, the hotel industry also is ripe for growth, according to the authors.